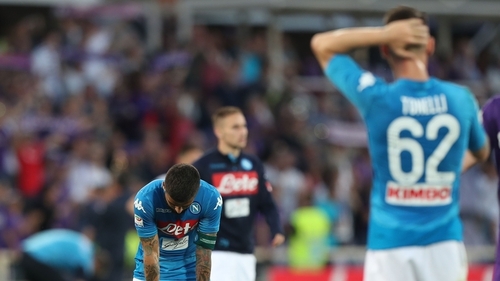 Napoli's dream of winning the Serie A title lies in tatters after they were humbled 3-0 by a Giovanni Simeone-inspired Fiorentina. A famous victory at leaders Juventus last weekend had closed the gap to a single point, but the Bianconeri won 3-2 at Inter Milan in dramatic fashion on Saturday to pull clear once again. Napoli could not keep step with their Scudetto rivals from Turin as, after Kalidou Koulibaly was sent off for fouling Simeone, the Argentinian scored a hat-trick to lift La Viola to a first win in four. The son of Atletico Madrid boss Diego drove Cristiano Biraghi's through ball beyond Pepe Reina in the 34th minute and later doubled up when Milan Badelj's headed attempt rebounded to his feet. Simeone compounded Napoli's woe with a killer blow from a Federico Chiesa pass deep into second-half stoppage time.